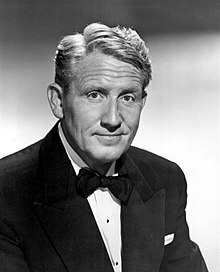 Spencer Tracy (April 5, 1900 – June 10, 1967) was an American movie and stage actor who appeared in 74 movies from 1930 to 1967. Tracy is considered generally as one of the best actors in motion picture history. In 1999, the American Film Institute named Tracy among the Greatest Male Stars of All Time, ranking 9th on the list of 100. He was nominated for nine Academy Awards for Best Actor, and won it two times, in 1937 and 1938. Along with Tom Hanks, he is one of the only two actors to ever be given two Oscars in two consecutive years. He was a long-time live-in partner of famous actress Katharine Hepburn whilst remaining legally married to another woman until his death. He was diabetic and died of a heart attack. He was a devout Catholic. This page was last changed on 7 May 2018, at 05:10.